and the Metro West Community Health Foundation. 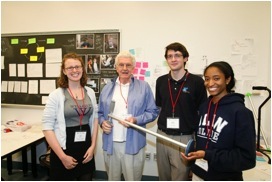 Photo and video of the “Stand Aid” team and other projects from the spring 2011 class. The team built this device to help their class volunteer get out of a car more easily. The device was intended to be easy to use and easily accessible from the driver’s seat. More press coverage. This course introduces students to engineering problem solving, beginning with understanding client needs and ending with an implemented, adaptable, adoptable, and sustainable solutions. The course will draw equally on empathetic and ethnographic methods and on a technical understanding of the problem and solution domains. Our client population for spring 2015 will be senior citizens who live in their own homes and who will be recruited before the class begins. Over the semester, we will learn about and with our clients; we will identify specific challenges that our clients face; and – together with our clients – we will develop concrete solutions to address these challenges. Students will leave Engineering for Humanity with a grounded understanding of the engineering problem solving process, experience in participant-­‐observer fieldwork, and hopefully a feeling of satisfaction at having made a concrete difference in the lives of members of our community. Course projects will be specific service projects that students identify and design while working with client partners (senior citizens in surrounding communities). For example, students might design a device to help someone who has difficulty reaching up to change a light bulb, something to help hold a newspaper steady with shaky hands, or something to enable someone to get clothes out of a clothing dryer that is difficult to stoop down to reach. Some sessions of the course will be devoted to co-­‐design with the client population or to team meetings. Other sessions involving guest speakers and fieldtrips, others with course discussion of topics relevant to aging. A sense of adventure and enthusiasm is, however, highly recommended. This course is suitable for students without prior engineering coursework and available for Babson and Wellesley students. The course will be taught seamlessly (2cr ENGR and 2cr AHS) with integrated activities and topics ranging from anthropology/sociology to design/build.